Since our start in 2001 we have taken pride in providing exceptionally clean windows for our customers and keeping them satisfied earning us an A+ rating with the BBB since 2003! When you hire us, you can expect excellence and professionalism. Our employees are experts in the field and have serviced tens of thousands of homes throughout the valley. Our screened employees promise to come with a nice smile, clean appearance, and clean vehicles. 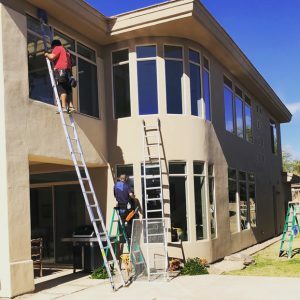 Our goal is to provide our customers with the cleanest windows possible. You can be confident that our teams will take great care working around window coverings, flooring and furniture. Our professionals will take care of your home as our own. After our first visit, we feel confident that you will become a lifetime customer. Schedule your window cleaning today!